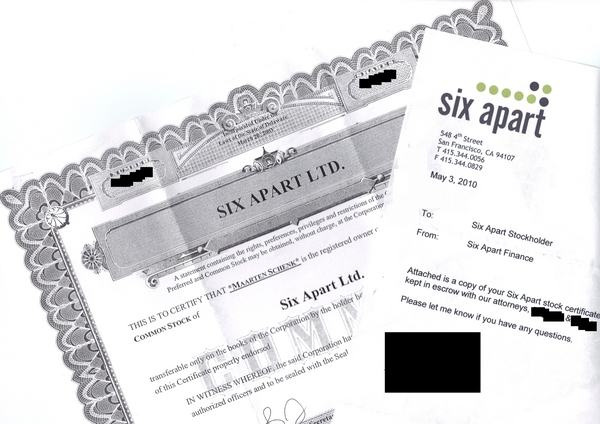 In the interest of full disclosure: I am now officially a Six Apart shareholder. My employee stock options vested some time ago and I excercised them shortly after leaving the company. Today I got an official letter & certificate in the mail. I now own an undisclosed number of shares in the company. Nice. I decided to buy the shares because I strongly believe in the company, its products and the teams behind them. Which is a good thing, as I work with some of these products daily and I plan to keep on doing this in the future. Right now, being a shareholder is more of a symbolic thing: my bug reports don't get priority, I don't get a cake on my birthday and as far as I am aware there are no special shareholder perks at Six Apart. But I see this as an investment in the future and I have high hopes for a nice payout one day.